Looking to increase your canine connection? Get practicing your downward dog with your pooch. The Ontario SPCA Provincial Education & Animal Centre in partnership with Woof-a-Palooza is hosting 2 partner yoga classes with your dog. 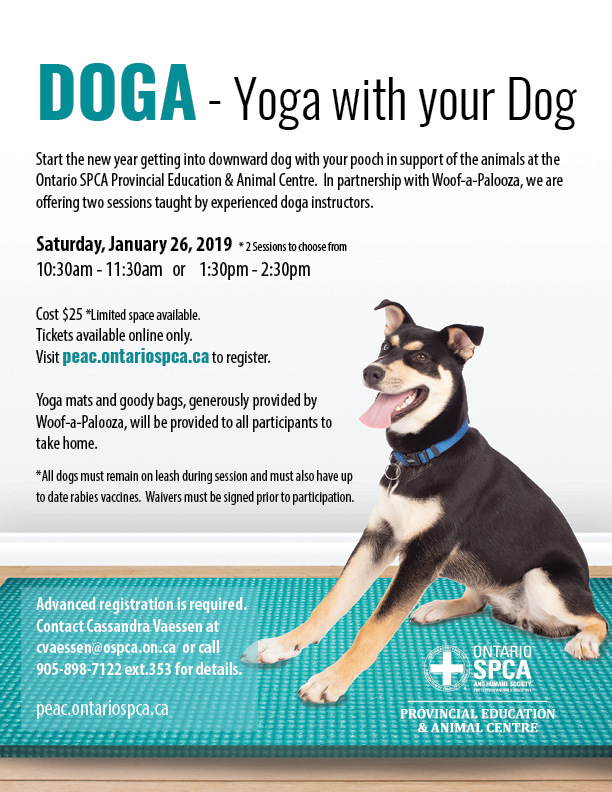 This event will be held on Saturday, January 26th at the Provincial Education & Animal Centre and will be taught by experienced doga instructors. There will be 2 separate sessions running: 10:30 – 11:30 am / 1:30 -2:30pm. Yoga mats will be provided for free by Woof-a-Palooza. Please come in athletic wear with your dog leashed. Goody bags will also be given to all attendees! Space is limited with only 12 spots available per session, so register today to secure your spot! Each 1-hour class is $25. No refunds; all proceeds will go to the animals at PEAC. Please arrive promptly for your doga session. Please note that dogs should be up to date on rabies vaccinations and a waiver must be signed before participating in the event.